The Horseshoe Crab is an ancient species that is highly adaptable to changing environments. They have a crescent (horseshoe) shaped shell with a long, pointed tail and sets of spines on their posterior end. Coloration is usually light tan to brown. To take in the surrounding environment, the Horseshoe crab has 10 eyes and can even see UV light. The blood has copper as the oxygen carrier and has been found to protect them from infection. Spawning season varies according to latitude but is generally at its peak from May to June. Adult Horseshoe Crabs seek beaches that are sheltered from the surf. Males arrive at the beach first and await the females' arrival. Juvenile Horseshoe Crabs spend the majority of their first two years of life on the intertidal flats. 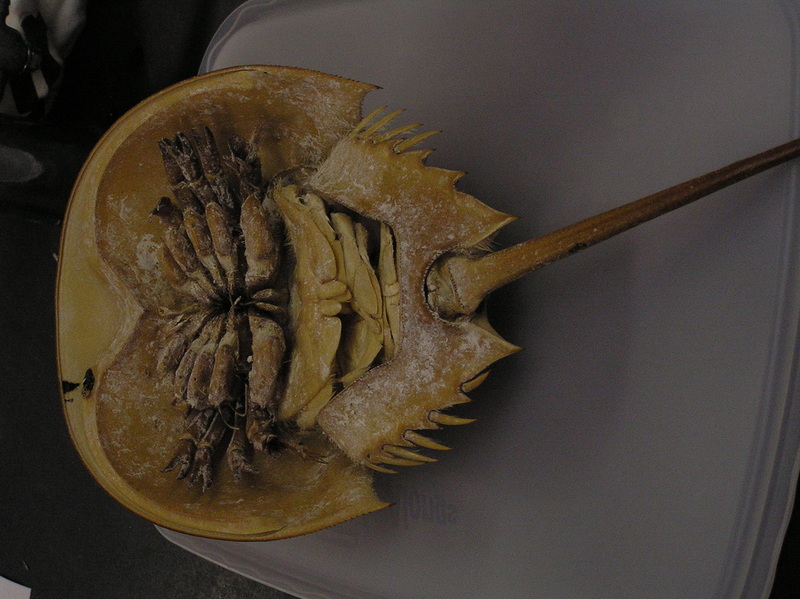 In order to grow, the Horseshoe crab must most out of its exoskeleton. As the crab ages, its growth rate slows. While in the adult life stage, the Horseshoe crabs usually remain in bay areas along the east coast of the U.S. They also require a sandy beach area within the bays that they inhabit to provide a suitable environment for egg survival and development. Some adults migrate into the Atlantic Ocean to overwinter on the continental shelf. The ability of the blood of the Horseshoe crab to resist against infection is of interest to scientists. Since the Horseshoe crab is such an ancient species, they can also provide taxonomists with clues as to the evolutionary history of life. The shells are sometimes sold as decorative elements. "About the Species". The Horseshoe Crab. Retrieved from: http://horseshoecrab.org/nh/species.html.